As Carrie and I were looking for places to stay we would often see the line “Serves a full Irish Breakfast”. 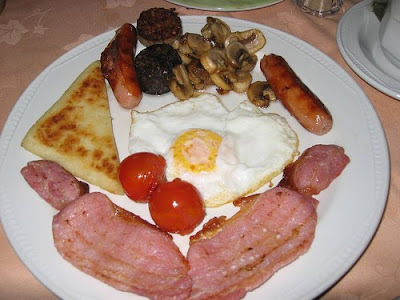 What in the world is a Full Irish Breakfast? We certainly had no idea, but I’m so glad we found out. 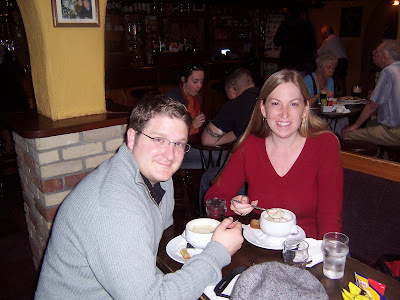 While on one of our day tour trips, we stopped in a pub and ate. They were serving this stew that looked amazing. Beef and Guiness stew is what it’s called. We were worried about the alcohol in it, so we didn’t order. Turns out the little extra ingredient cooks out. Problem was, when we found that out we had already ordered something else. Then when we went looking for it we could never find it again. Oh well, something to save for the next trip. Aside from the breakfasts, the pubs definitely had the best tasting food. 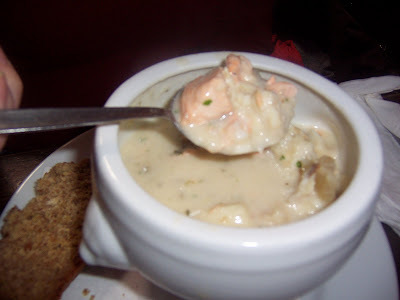 While we didn’t get the stew, we did order some chowder that tasted really good. Atlantic Chowder is what they called it. It had salmon, potatoes, some assortment of other kinds of fish and tasted really good, once you added a bit more salt and pepper to the mix. Oh, the bread on the left, that’s brown bread. Imagine the taste of a typical bread with more of a texture of zucchini bread, that’d be brown bread. Really quite good. 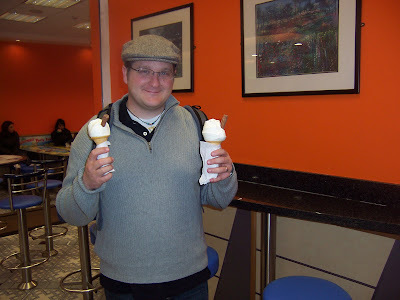 In Galway one of the nights we were there, we had fish and chips (fries) and got an icecream cone. We specifically went to a place because we saw these chocolate sticks and wanted one of those to go with our icecream, well turns out the place we ate at didn't have the chocolate sticks. Carrie was really disappointed and was being too shy to try going into a different restauran to ask for some. I figured we didn't travel all this way only to miss out on something one of us REALLY wanted and had the chance to do, so I found a place that sold icecream and bought us some chocolate sticks, even then Carrie was telling me I didn't have to. 35 euro a piece in case you were wondering. They were good too, but it was really worth it to make Carrie happy, so she took a "My Hero" picture. At the Kylemore Abbey I had lamb and potatoes. It looked impressive, smelled impressive but didn't tase impressive. It tasted like a roast that had entirely too little seasoning and wasn't nearly as fun as it looked like it'd be. In Dublin while we were walking around, we stopped into this café that offered a sandwich and hot drink for 5 euro. We both ordered hot chocolate. I wish I had taken a picture of that. They made it with REAL European chocolate, melted down and mixed with milk. It was so thick and rich. Then they sprinkled cinnamon on top and topped it all off with some whip cream. If I woke up every morning to a cup full of that, I could die a very happy man. If I did though, I’d probably die sooner rather than later because it tasted too good to be anywhere near good for you. All in all, the breakfasts, those were amazing. Filled me right up and took care of me for most of the day. Since we've been back I've been craving a good Irish Breakfast. I'd love to have one topped off by a cup of hot chocalte.